President Trump wants to build a wall to limit the inflow of organized criminals to the United States from the Southern border. 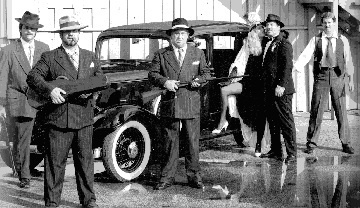 In this article I will share anecdotes about organized crime. I remember a restaurant opening near my house in a country I won't name. The restaurant did not serve food, but had very cheap beer, way cheaper than I could find anywhere else. The restaurant was always empty and soon enough I informed my friends about the gem I had found. The cheapest beer in town. We went there a few times, but got uncomfortable with the idea that we were the only guys drinking there, that the waiter always had the same clothes on, and that the waiter refused that we pay a couple of times. Organized criminal organizations often use restaurants as their official business. Restaurants with no name, no customers, no food, no drinks, but an address and a business number. In the case described above they did serve very cheap beer to avoid any suspicions, but a lot of times they won't serve much of anything. What areas do organized crime organizations work in? Drug trafficking, human trafficking, prostitution, illegal gambling, shark loans, alcohol and cigarette trafficking, weapons trafficking, scams, and many, many other illegal activities. In the restaurant I described above, my friends and I stopped going there because we were no longer sure what they were putting in our beers. We preferred to play it safe. But why, say, wouldn't the FBI identify organized criminal organizations, arrest the culprits, bam, no more organized crime! Well it's a lot more complicated than that. Let me give you an example. In a country that I won't name, a drug lord got arrested for dealing drugs. The problem is his drug gang also had a monopoly on several key medications, including diabetes medication and other vital medication. What did his gang do? They start off soft. They stopped distributing adult diapers, the kind old men and women in retirement homes use. The entire country had no more adult diapers. Retirement homes had to improvise by using reusable cloth diapers that they had to wash, and that are not very practical when old men pee. That meant more cleaning for nurses in retirement homes, less hygiene, more trouble. Complaints started fusing, and soon enough, what do you know, the drug lord was released, and adult diapers were back in the market. Organized criminal organizations don't just control the distribution of key medication and medical equipment. They often control and have monopolies on the distribution of alcohol, cigarettes, food ingredients, movies and in some cases the internet. Next time your brand of cigarettes is missing from all the shelves, or the internet slows down, or your favorite brand of liquor is missing from most stores, some drug or weapons or prostitution lord probably just got arrested. And if they arrest the gang massively, there will be no more alcohol on the shelves. Not to mention medication. That's just one side of the story. Gangs are also armed, in some cases to the teeth. They start off by taking diapers off the shelves, but soon enough it's people who are going to get shot. What do governments do? If they can't beat them, they join them. That's the only way to put yellow lines and red lines for gang members not to cross. So yes politics is dirty, corrupt, petty criminals are in jail while big criminals are roaming the streets freely. It is an unfair world after all. There's a lot more to the story, but I think you get the idea.